Reese’s peanut butter trees are a holiday favorite for me. I always loved getting one of these in my stocking as a kid and putting them in someone else’s stocking as an adult. But they are filled with sugar and are not good for the Keto diet. But don’t worry, this Keto peanut butter trees recipe is here to the rescue! Each of these Keto peanut butter trees have about 3 net carbs (2.66 to be exact based on my ingredients) and taste really close to the real thing. I taste tested this recipe on my sister (she is Keto) and on my partner (he is not Keto) and they both loved these. They taste very much like a real Reese’s one!!! Which is exactly what I was going for. PLEASE NOTE: these are VERY sweet. Just like a real Reese’s tree would be. 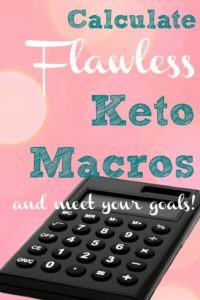 If you are new to Keto, you’ll probably enjoy this. 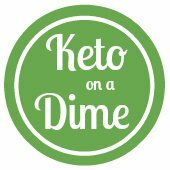 If you’ve been on the Keto diet for awhile, the sweetness might be overpowering if you aren’t expecting it. 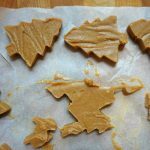 What do I need to make Keto Peanut Butter Trees? 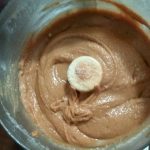 The ingredients for this recipe are fairly simple and will use a lot of Keto staples you likely already have at home-salt, butter, vanilla, peanut butter, powdered sweetener, almond flour, sugar free chocolate chips, cacao butter (or coconut oil). Since these ingredients are common, these Keto peanut butter trees won’t cost you an arm and leg. I made 12 trees out of this recipe and it cost me less than $10. Based on the ingredients I used, it worked out to be about $0.82/tree. At my local Target store, a 6 count package of Reese’s peanut butter trees is $4.39=$0.73/tree. This recipe cost me about $9.83 for 1=$0.82/tree. Not bad for a sugar free, Keto peanut butter tree. 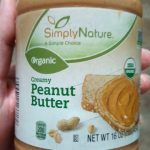 1.Peanut Butter-I used the all natural organic peanut butter from Aldi. This has the closest consistency to the sugar filled regular peanut butter I used to love. Justin’s brand is my second favorite. Use what you like, just avoid anything with added sugar. 2. Powdered Erythritol-I always buy the granular erythritol and grind it up in my coffee grinder, because it’s cheaper. You can also use powdered Swerve, which is erythritol that is already in powdered form. 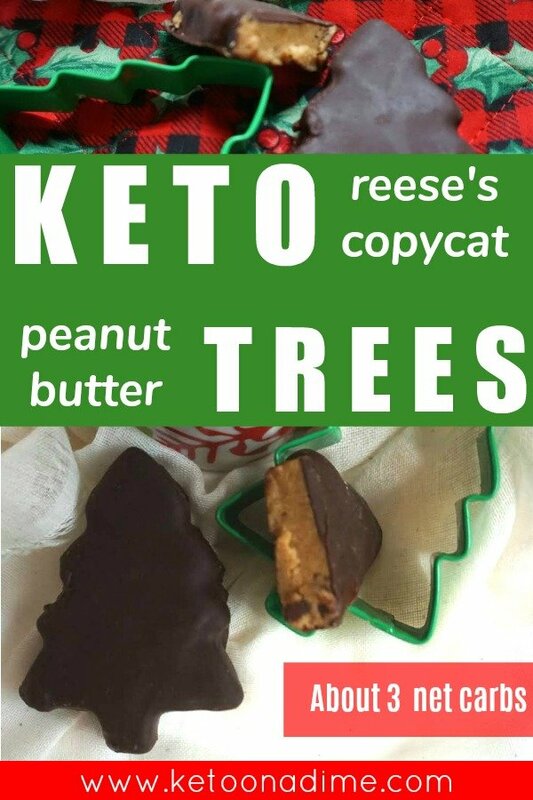 If you use regular erythritol, these Keto peanut butter trees will turn out grainy and gross, so please don’t do that. 3. Almond Flour. I use the Anthony’s brand (unblanched) that I find on Amazon. It’s almost always the cheapest and I’ve had great results with it! 4. The chocolate. I used Lily’s chocolate chips here. You could also melt down a Lily’s chocolate bar or another sugar free chocolate bar of your choice, just keep in mind, this changes the carb count! 5. Cacao butter or coconut oil. Don’t skip this step, trust me. When I first tried it, I only used the chocolate chips and the melted chocolate was very clumpy and gloopy. Don’t do that, mix the chocolate chips with some cacao butter or coconut oil. If you’re don’t have coconut oil or cacao butter, you could use regular butter as a last resort, but it will change the consistency. 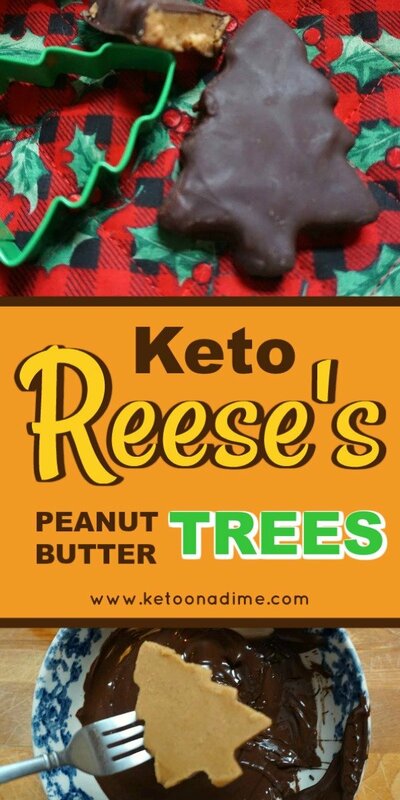 Keto copycat "Reese's" Peanut Butter Trees are a sugar free, low carb and keto friendly version of the original. 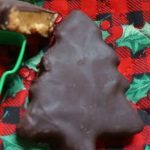 Keto peanut butter trees taste just like the real thing. Make these to take to a holiday party, to have on Christmas Eve, as stocking stuffer or even a gift for a Keto friend. You will love these! Add melted butter, peanut butter, vanilla, powdered erythritol, vanilla, almond flour, and salt to a food processor. Pulse 6 times and then blend together until smooth. You can use an immersion blender or standing blender if you don't have a food processor. 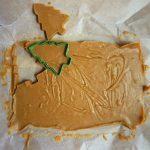 Use a christmas tree cookie cutter to cut the peanut butter mixture into as many trees as possible. While the cut outs freeze, melt down the LIly's chocolate and cacao butter (or coconut oil). I like to use a double boiler. You can melt in the microwave, but be careful not to burn it. Note: Adding the butter or oil is important, because if you only use the chocolate chips, the mixture will be too thick to dip the trees into. 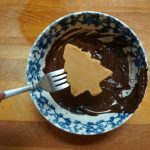 The easiest method is to use a fork, stick it in the side of the tree, dip one side in the chocolate, flip it over and dip the other side. Use a spoon or rubber spatula to cover any bare spots. Lift the tree out of the chocolate with a fork. 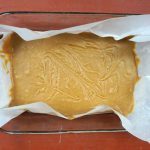 Place the covered Keto peanut butter tree on wax or parchment paper to dry. Once the chocolate is set, you can transfer these to the refrigerator. These can be stored at room temperature, but I suggest storing in the fridge or freezer. I like to wrap these in decorative Christmas treat bags (like this) to put in a Christmas stocking or give as a gift! I hope you make these and LOVE THEM! Make sure you share this on Pinterest, spread the Keto peanut butter tree love! Could you replace the almond flour with PB powder?